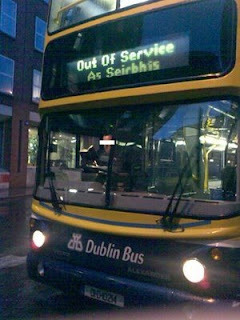 As we all know by now, the provision of bus services in Ireland is subject to legislation enacted in 1932. One could argue this is a bad thing (a few things have changed in the intervening 76 years etc), but maybe it's a blessing in disguise? Part II, Section 13(2) of the Act empowers the Minister to revoke the licence of any bus service operator on 31st October of each year. So here's a suggestion: revoke the licence of Dublin Bus, and invite anyone with qualified drivers and insured vehicles - willing to risk their own money on establishing and promoting their bus services - to do just that. I don't doubt many of the current managers and drivers in Dublin Bus will thrive in such a scenario as they set up their own services. Needless to say, not a penny of tax payers money should be given to any of these new operators. The tax subsidisation of transport is the single largest source of the mis-allocation of investments in transport. I include roads and road users in that by the way (why non-drivers should subsidise my driving experience through their taxes is beyond me). It seems to me this is the only way to stop the predatory practices of Dublin Bus that choke off competition, as well as the farcical situation whereby the taxpayer is liable for both Dublin Bus' successes as well as its excesses. In effect, we will be doing the reverse of what the Government in Santiago in Chile did in the past year: they closed down 3,000 private bus operators and replaced them with one state owned service. The result: average journey times have gone up from 40 minutes to 2 hours; the combined profits of $60 million generated by the private operators have now been replaced by losses of over $600 million; and the operators of the new public service say they will go bankrupt if they are not bailed out by taxpayers soon. This story of the dysfunctional state administration of public transport is explored in a very witty and sharp discussion over at Econtalk. It begs the question: why should the state have any act or part in operating public transport services? Does the Irish Government run our taxi services? Perish the thought, eh? Beyond setting the conditions for issuing licences (the conditions in Section 12, preceding those in Section 13 referred to above seem sufficient) it is not necessary that they do anything else. The same goes for emptying the bins - local authorities can be just as predatory as Dublin Bus in that regard. I think the vast majority of dublin bus users don't give a hoot who is running their buses as long as there is plenty of them and they go the right way. Right now we are in the worst of worlds in Dublin as the expansion of the network is being strangled by the drive to introduce competition which in trun is being strangled by the incumbent. All this means we loose sight of what is realy needed which is a plenty of buses on the right routes. The question we have to ask ourselves is how long we will continue to keep dublin bus in its box in a futile attempt to make room for private operators. I used one of these private operators and the service stunk. they were essentially a rual bus company trying to operate an urban service and it didn't work.